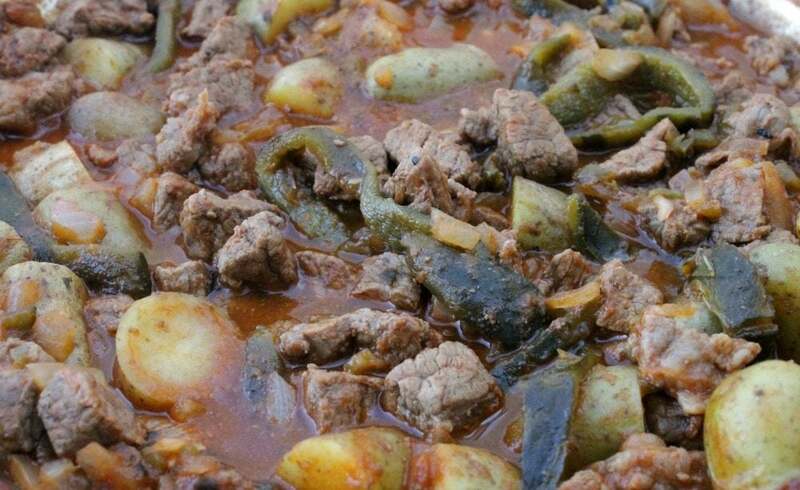 Beef with Roasted Poblano Chile and Potatoes, or Carne de Res con Rajas y Papas, is a delicious and spicy dish. Mexican comfort food at its best. What’s your definition of comfort food? For my New Yorker husband, it’s pie, steak, and potatoes. I didn’t taste a lot of the American staples until I was much older. Maybe 21 or so. 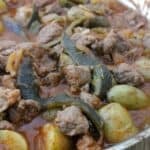 Before that, it was Tamales, Chorizo con Papas, Tinga, and this dish: Beef with Roasted Poblano Chile and Potatoes (or Carne de Res con Rajas y Papas). 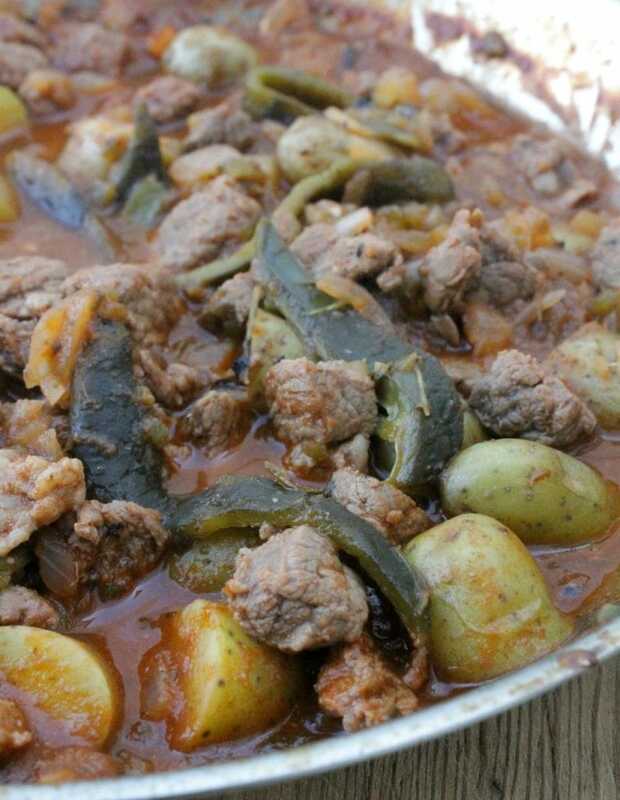 In a nutshell, it’s meat with slices of roasted chile poblano and potatoes in a savory red sauce. 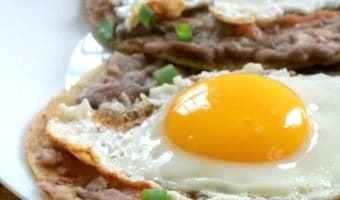 It’s a classic Mexican dish that any sombrero-wearing, grito-shouting Mexican would know. For my Beef with Roasted Poblano Chile and Potatoes (or Carne de Res con Rajas y Papas), I’m using chopped up top round roast. 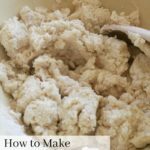 You can also use any beef meat. Slice into 1-inch cubes. Salt and pepper these bad boys and now take them to the pan. Sear on all sides until they turn brown. 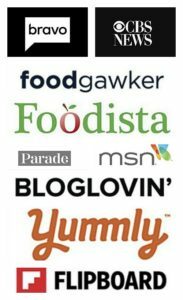 Color means flavor in the cooking world. You really want to give them a good brown color. Word to the wise: Roast your poblanos ahead of time. It will save you some cooking time. FYI: I’m using fingerling potatoes, but you can use regular russet, peeled and diced. 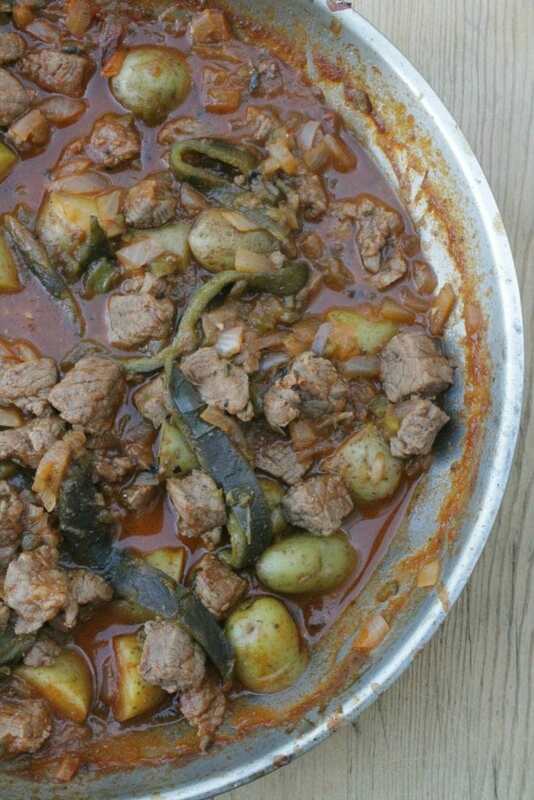 Beef with Roasted Poblano Chile and Potatoes (or Carne de Res con Rajas y Papas) makes such a great weeknight meal. It’s a one pot wonder that’s loaded with flavor and good spice. 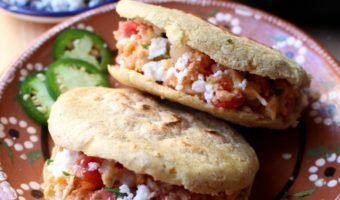 Mexican comfort food at its best. 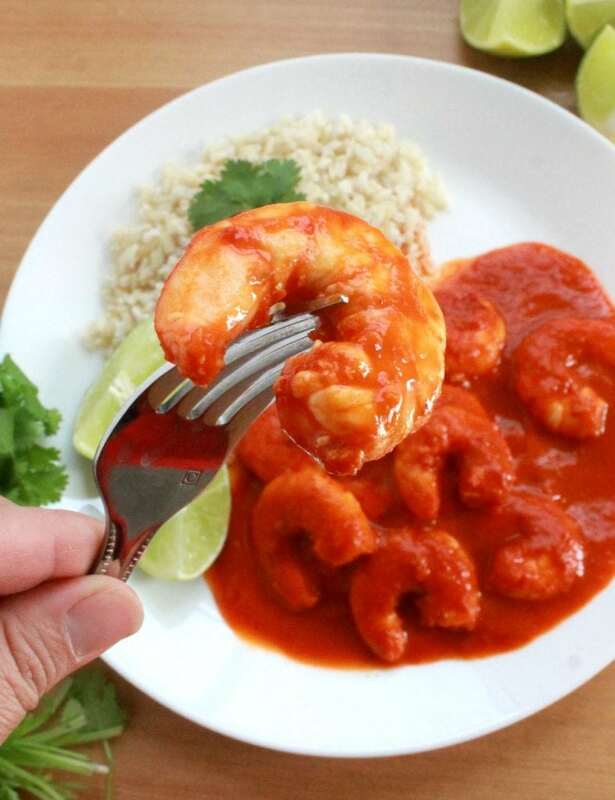 Serve it with rice and refried beans. Don’t forget the tortillas! Hope you enjoy. Carefully roast the poblano chile until black on all sides. 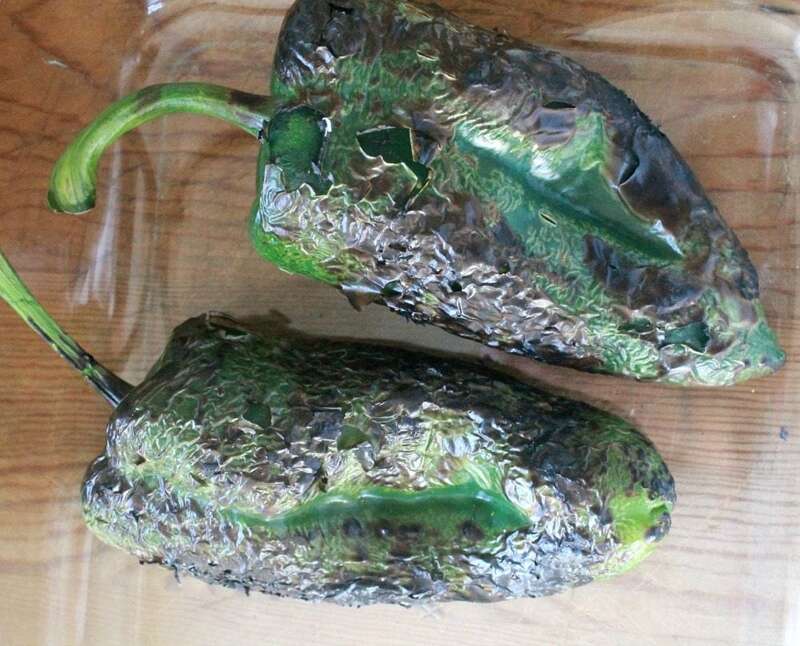 Wrap the roasted chile poblano in plastic to sweat. 10 minutes. Remove charred skin and open to devein and to remove the seeds. Then slice into strips. Set aside. Add meat to the pan and brown on all sides. 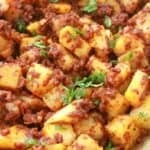 Remove the meat from the pan and add potatoes, stirring frequently. Return the browned meat to the potatoes. Add the bouillon, 1 cup beef broth, and cumin. Give everything in the pot a stir and add the poblano chile strips. Add the diced tomato and garlic to a blender. Add to tomato sauce the pan. Cook for 10 minutes or until potatoes are soft. Those roasted poblanos are calling my NAME! Love it! 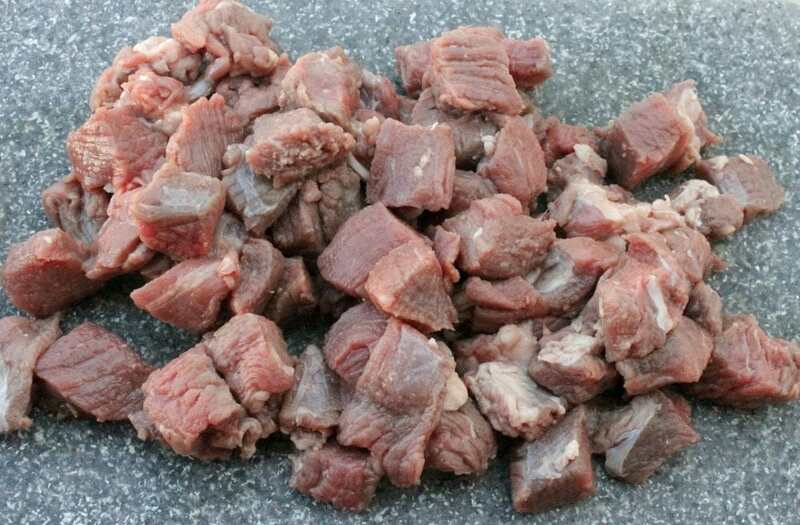 This looks like a great stew! I’m all about roasted potatoes and peppers! 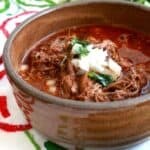 Beef, Chile and Potatoes sounds like one heck of a combo! Looks so delicious too! Never had this before but sure sounds like comfort food to me!